Enjoy the convenience of a completely wireless remote control model that is easy to operate with many features; maximum comfort with minimum effort. 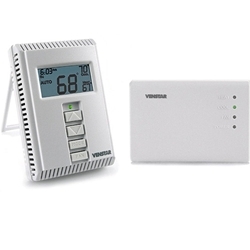 Remove your old wall thermostat, replace it with the Venstar Wireless Thermostat Receiver (T1100REC) and then remotely control the temperature anywhere in your house with the Venstar Add On Wireless Thermostat (T1100RF). Thermostat is completely wireless. Receiver can be mounted at unit or at old thermostat's location. Up to 4 thermostats can be used with one receiver. Transmits up to 500 feet, through walls and floors. 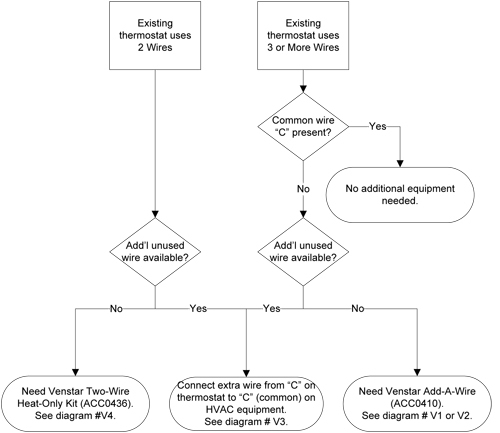 Dual-setpoint with adjustable deadband (1 to 6 degrees) and temperature sensor calibration. All programming stored in nonvolatile memory. Display shows heat and cool setpoints, mode, and room temperature simultaneously. Setpoint adjustment range from 35F to 99F, sensing range from 32F to 99F. 64 house codes allow installation of up to 64 systems within transmit range with no interference. Meets California Residential Title 24. Approximate dimensions: T1100REC - 4.75" x 3.25"; T1100RF - 3.25" x 4.75"